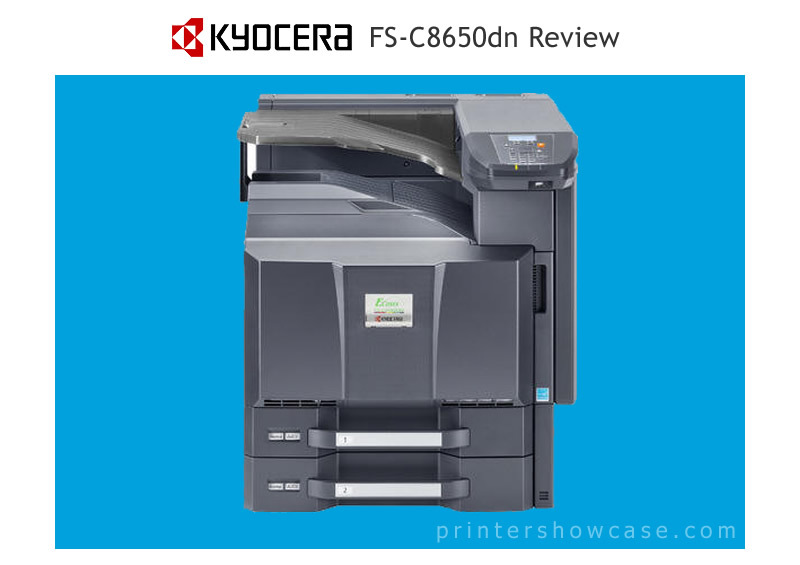 In Short: The Kyocera FS-C8650DN is an 11X17 network color printer intended for high volume printing. Setting up the Kyocera is not more difficult than other printers but it does take a little longer. The first time Kyocera printers see toner at power up, they must cycle for a while before they are ready to print. 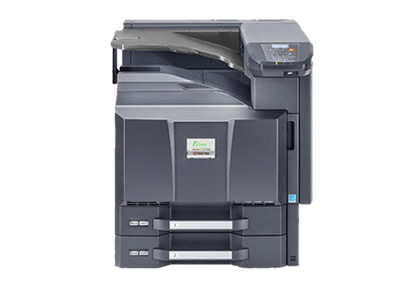 The Kyocera C8650DN is rated at 50 color pages per minute letter size, and 55ppm in black and white. In actual use, the Kyocera printers tend to print near or at rated speed so this a fast printer. The C8650DN ships with a fast Ethernet, 1GB RAM, and a 160GB HD. 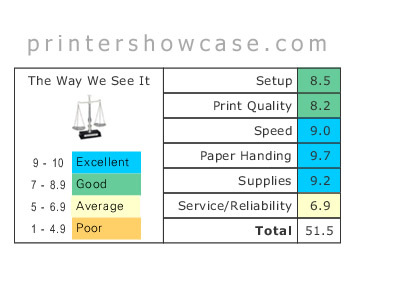 Even though the Kyocera C8650DN is rated at 600X600 DPI which is lower than the other machines in this price range, the 8 bit depth coupled with Kyocera’s eco toner produce good looking color print quality, appropriate for marketing material, presentations, or renderings. If you need to print larger drawings on 11X17 or other very small type, or you need to print very fine details, the 600dpi may be more difficult to read and line weights will appear heavier. The Kyocera C8650DN comes standard with two 500-sheet feeders that will accommodate paper up to 12X18 and as heavy as 256g/m2, plus one 150-sheet by-pass tray that can handle paper up to 300g/m2. There are several paper feeding and finishing options available for a multitude of configuration possibilities. The Bottom Line: The Kyocera C8650DN is a fast color network printer that has decent print quality, excellent paper handling, and a very low cost per page. The graphic and design users or others that require very high resolution output should probably look elsewhere. The unique Kyocera engine requires that only a technician may install or replace photo conductors and other long term maintenance kits. This is a sticking point for many users that want to minimize service calls and down time, or remote users without access to on-site service techs. The Kyocera C8650DN speaks PCL, PS3, and several other emulations. It works well with most all current and semi current OS including Windows, Mac, and UNIX.